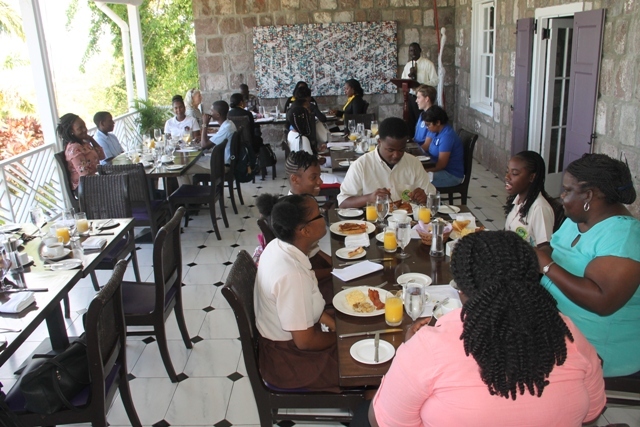 John Hanley, acting permanent secretary in the Ministry of Tourism, addresses the students at the breakfast launch of the Bank of Nevis Limited Tourism Youth Congress at the Montpelier Plantation and Beach Club on April 18. 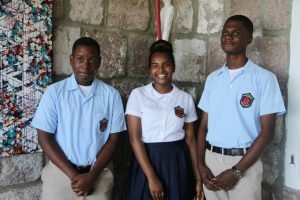 Mikkel Maloney, Kimberly Dookhan and Recardoe Rodriques are students of the Charlestown Secondary School who will be participating in the local leg of the Bank of Nevis Limited Tourism Youth Congress May 17 at the Nevis Performing Arts Centre. 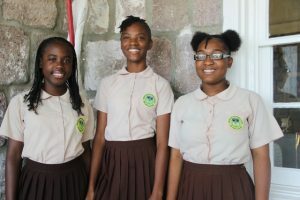 Ajuma Liburd, Shaianu Tyson and K-Tara Huggins are students of the Gingerland Secondary School who will be participating in the local leg of the Bank of Nevis Tourism Limited Youth Congress May 17 at the Nevis Performing Arts Centre. 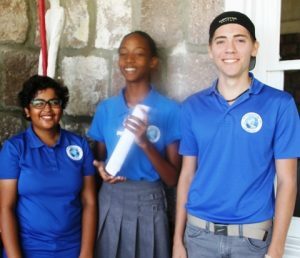 Tarana Anadkat, Eliyse Thomas and Jesse Wyly are students of the Nevis International Secondary School who will be participating in the local leg of the Bank of Nevis Limited Tourism Youth Congress May 17 at the Nevis Performing Arts Centre. CHARLESTOWN, Nevis – John Hanley, acting permanent secretary in the Ministry of Tourism, encouraged students participating in the Bank of Nevis Limited Tourism Youth Congress scheduled for May 17 to be mindful of the benefits that come with taking part in the forum. The tourism official was delivering remarks at the launch of the congress April 17 at a breakfast hosted at the Montpelier Plantation and Beach Club. The event is the local leg of the Caribbean Tourism Organisation’s (CTO) Caribbean Youth Tourism Youth Congress. Hanley told the participants that only one school can be the winner and it was up to them to determine whether they wanted their school to be the winners. He encouraged them to prepare in earnest for the event. He thanked the Bank of Nevis for its sponsorship of the congress for the past seven years and used the opportunity to pay respects to Bonita Morgan of the Caribbean Tourism Organization (CTO), who has recently passed. She was responsible for introducing many impactful projects and programmes at the CTO, including organising the annual tourism youth congress. At the launch, representatives from the secondary schools were introduced: Mikkel Maloney, Recardoe Rodriques and Kimberly Dookhan from the Charlestown Secondary School; Shaianu Tyson, K-Tara Huggins and Ajuma Liburd from the Gingerland Secondary School, and Eliyse Thomas, Tarana Anadkat and Jesse Wyly from the Nevis International Secondary School. The winner of the local leg of the contest will become the new Youth Junior Minister of Tourism on Nevis, and will form part of a team representing the island at the 2018 Caribbean Tourism Youth Congress later this year, during the CTO’s annual State of the Industry Conference (SOTIC) in The Bahamas. Also present at the launch were reigning Youth Junior Minister of Tourism Devonne Cornelius; marketing officer at the Bank of Nevis Limited Pheon Jones; and staff from the Ministry of Tourism, including Dorson Ottley a former staff member.